Thalassemia is a disorder of hemoglobin that causes a hemolytic anemia. Hemolysis is a term to describe the destruction of red blood cells. 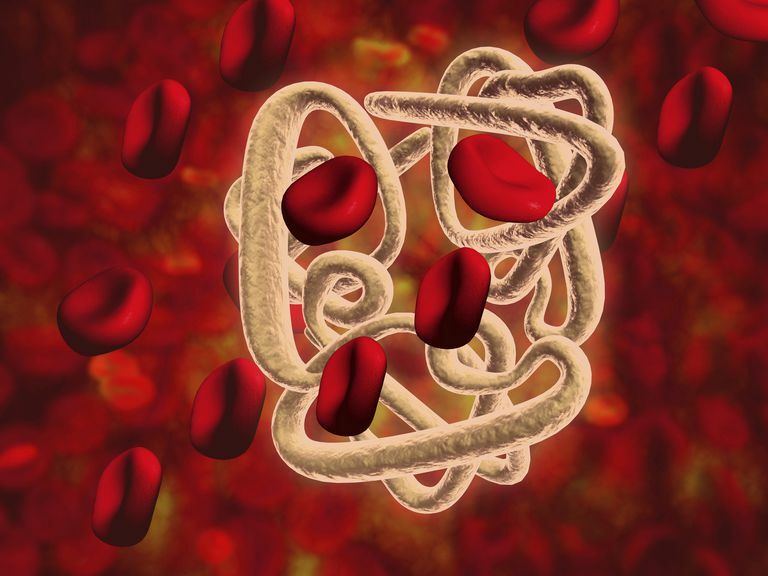 In adults, hemoglobin is made of four chains—two alpha chains and two beta chains. In thalassemia you are unable to make either alpha or beta chains in adequate amounts making your bone marrow unable to make red blood cells properly. The red blood cells are also destroyed. Is There More Than 1 Type of Thalassemia? The symptoms of thalassemia are predominantly related to the anemia. Other symptoms are related to hemolysis and bone marrow changes. Thalassemic facies – because of the hemolysis in thalassemia, the bone marrow (place where the blood cells are formed) goes into overdrive. This causes enlargement in the bones of the face (predominantly forehead and cheek bones). This problem can be prevented by proper treatment. In the United States usually the more severely affected patients are commonly diagnosed via the newborn screening program. Milder affected patients may presented at a later age when anemia is identified on a complete blood count (CBC). Thalassemia causes anemia (low hemoglobin) and microcytosis (low mean corpuscular volume). Confirmatory testing is called a hemoglobinopathy work-up or hemoglobin electrophoresis. This testing reports the types of hemoglobin you have. In an adult without thalassemia, you should only see hemoglobin A and A2 (adult). In beta thalassemia intermedia and major, you have significant elevation in hemoglobin F (fetal), elevation of hemoglobin A2 with significant reduction in the amount of hemoglobin A formed. Alpha thalassemia disease is identified by the presence of hemoglobin H (a combination of 4 beta chains instead of 2 alpha and 2 beta). If the testing is confusing, genetic testing might be sent to confirm diagnosis. Who Is at Risk for Thalassemia? Thalassemia is an inherited condition. If both parents have alpha thalassemia trait or beta thalassemia trait, they have a one in four chance of having a child with thalassemia disease. A person is either born with thalassemia trait or thalassemia disease—this cannot change. If you have thalassemia trait, you should consider having your partner tested prior to having children to assess your risk of having a child with thalassemia. Close observation: If the anemia is mild—moderate and well tolerated—your physician may see you on a regular basis to monitor your complete blood count. Medications: Medications like hydroxyurea, which increases your production of fetal hemoglobin, have been used in thalassemia with varying results. Blood transfusions: If your anemia is severe and is causing complications (e.g., significant splenomegaly, thalassemic facies), you may be placed on a chronic transfusion program. You will receive blood transfusions every three to four weeks in an effort to have your bone marrow make as few red blood cells as possible. Bone marrow (or stem cell) transplantation: Transplantation can be curative. The best results are with closely matched sibling donors. A full sibling has a one in four chance of matching another sibling. Iron chelation: Patients who receive chronic blood transfusions acquire too much iron from the blood (iron is found inside red blood cells). Additionally, people with thalassemia absorb greater amounts of blood from their diet. This condition called iron overload or hemochromatosis causes iron to be deposited in other tissues in the liver, heart, and pancreas, causing damage to these organs. This can be treated with medications called iron chelators that help your body get rid of excess iron. What Happens When the Body Can't Produce Hemoglobin? What Does My Antibiotic Have to Do With My Anemia?